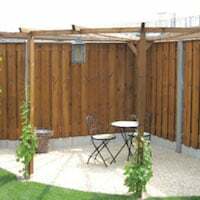 On the Agnes Log Cabin product page, we show you plenty of images of our customer’s Log Cabin to show you what you can do with them. As well as all the fine details on the dimensions, technical tips as well as our quality checks for each Log Cabin. Built using first rate timber from the Spruce trees of Sweden the 45mm Agnes Log Cabin measures 3.0 x 4.4m. Featuring double doors, two opening windows and separate access door to the shed annexe with a full height partition to ensure clear distinction between the two components. “This cabin is fantastic! It’s so nice I’ve recommended a friend to buy one!! The installation for the Agnes Log Cabin is a simple process, so long as you keep organised. You can find loads of information in order to be fully prepared for installing your Log Cabin on the Essential Installation Manual as well as plenty of other Log Cabin Fitting Tips throughout the blog, from our expert (practically), Richard. Agnes log cabin customer gallery. 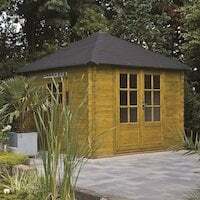 With the additional side storage space and 45mm logs, the Agnes Log Cabin is ideal for a summerhouse or home office- even more! For more details such as measurements and the breakdown of what comes within the self build kit, please look at the Agnes Log Cabin product page. If the Agnes doesn’t quite meet your fancy, then maybe you’ll prefer the: Emma Log Cabin, Asmund Log Cabin or the Aiste Log Cabin. On the Blackpool Log Cabin product page, we show you plenty of images of our customer’s Log Cabin to show you what you can do with them. 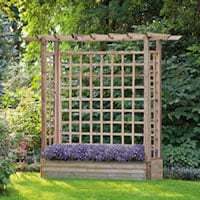 As well as all the fine details on the dimensions, technical tips as well as our quality checks for each Log Cabin. The Blackpool Log Cabin , 58mm thick wood and double glazed windows and doors. 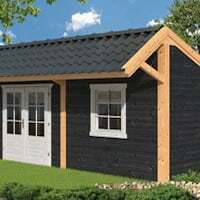 Made from 58mm slow grown Spruce timber, the Blackpool Log Cabin comes at a size of 4.4m x 3.4m. 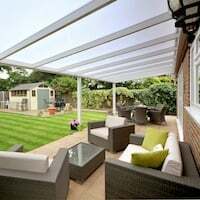 A perfect size for additional living areas, a home gym, home pub- even a garden office! Get plenty of natural light inside this Log Cabin with its full frontal double glazed doors and side windows. A durable building with its cost balancing out with future heating costs (especially if you add insulation!). Mr H’s review of his Blackpool Log Cabin. So long as you keep organised and follow suit of the information given on the Essential Installation Manual, as well as plenty of other Log Cabin Fitting Tips that are posted throughout the blog- written by our one and only, Richard. I was thinking the same, the cost of the cabin will balance out on heating costs over the years- but we recommend insulation in the roof and floor to make sure it really stays nice and cosy in the colder months! For more details such as precise measurements, pricing and a list of what will be included within the self build kit, please see the Blackpool Log Cabin product page. 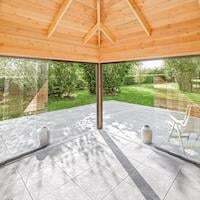 If the Blackpool isn’t quite for you, why not take a look at the Aiste Log Cabin Showcase, or if you desire the 58mm log thickness- then the Stian Log Cabin might be more suitable. 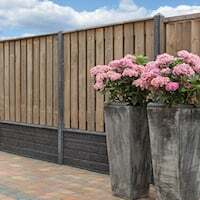 On the Berlin Log Cabin product page, we like to give you the nitty gritties of the product in terms of dimensions, technical installation tips and the best feature of said product. 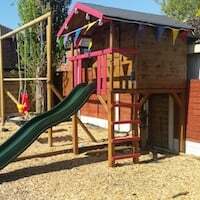 But, on this page we let our previous customers voice their opinion on the Berlin Log Cabin and let them show you their thoughts, ideas and pictures! 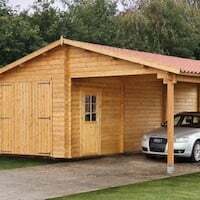 We may also have our team input why they desire that particular product too, so here goes..
A large building from our private label range of log cabins. This building features two rooms and an upper level floor, measuring at 4.90m x 5.30m with 45mm thick logs and double glazed windows the Berlin is ideal for use as a home office, gym or additional accommodation. Featuring both double and single doors with three tilt and turn windows to give you plenty of access and natural light. The installation for the Berlin Log Cabin is a simple process, so long as you keep organised. You can find loads of information in order to be fully prepared for installing your Log Cabin on the Essential Installation Manual as well as plenty of other Log Cabin Fitting Tips throughout the blog, from our expert (practically), Richard. 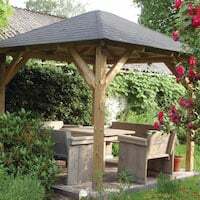 When paired with some Roof and Floor Insulation, the Berlin is the ideal size for some additional accommodation in your garden, or even your own hideaway to let your creativity run wild. 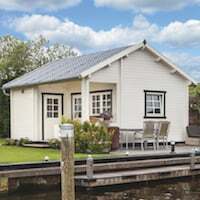 For more details such as measurements and the breakdown of what comes within the self build kit, please look at the Berlin Log Cabin product page. 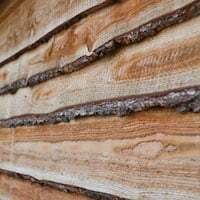 If you’d prefer a thicker log for better heat capacity, we recommend you reading about the Blackpool Log Cabin, the Stian Log Cabin or even the Ben Clockhouse Log Cabin.